I can tell you now I didn’t take the Playsport on any “sick runs” but I did do my best to test out Kodak’s claims as well as seeing just how user friendly it is. The Playsport, or Zx5 if you prefer, is available for around the £100 mark but the Burton edition, which comes with a mini tripod, remote, carry case and 4GB SD card, will set you back around another £70. Still, for that money, a water, shock and dust-proof video camera capable of 1080p HD recording looks very promising. I think the Playsport Burton edition looks and feels fantastic. The soft touch rubber/plastic outer casing, which is held together by four visible bolts, gives it an unparalleled feeling of sturdiness. As you’ll see in the video just below, there are two lockable rubber-covered metal doors that are mounted on springs. On one side there is the HDMI out and USB port and the other door hides the SD card slot. The blurb on the box says the Zx5 can survive the impact from a fall of 1.5m and I’ll have to take them at their word because I didn’t want to risk getting told off by Kodak for damaging their review unit. I did give it a good thorough shake though, I’m not a total wimp, and afterwards there was no rattling or any other effect for that matter. The Playsport claims to be waterproof up to a depth of 3m and I was determined to test this, however, all I have is my sink, which isn’t 3m deep, so I rang round all four of my friends to see if any of them had 3m deep sinks. I fancied my odds. You’ll be as surprised as I was to hear that not one of them did. Anyway, I just stuck it in my normal sink to test it’s under water capabilities and, as you’d expect, image quality is obviously effected by the water but more importantly there were no signs of water leaking in. Onto the actual spec, a 5MP camera that is capable of full 1080p HD recording at 30fps. You can also grab 720p at 30 or 60fps and WVGA at 30fps. The 5MP camera can also be used to snap a quick picture as well, with the resulting image being displayed on the 2 Inch LCD screen, which is a little dark, but otherwise quite impressive. Here are two sample shots: 1 & 2. The Playsport has 4x digital zoom, which at times comes close to ruining what you are trying to record, but digital zoom is better than no zoom I suppose. The same can be said for the image stabilisation, not the best but still worthwhile. The Zx5 also packs a small number of effects, such as sepia, high saturation and 70s film. There is also an underwater correction mode. In terms of audio control, the Playsport does have microphone gain control so it is possible to compensate for either quiet or loud sound. The footage I recorded (below) isn’t the sharpest nor is it the clearest but it has to be said it deals well with movement. Yes I did run around central London holding up the Zx5 so that you could benefit. Some would call that selfless, but not me, I’m just doing my job. In this second clip you getter a better idea of the level of sound the Playsport is capable of delivering and it isn’t that shabby, I was impressed. I didn’t alter the gain control so you can hear the general traffic and hustle bustle but the microphone also pics up smaller sounds well. 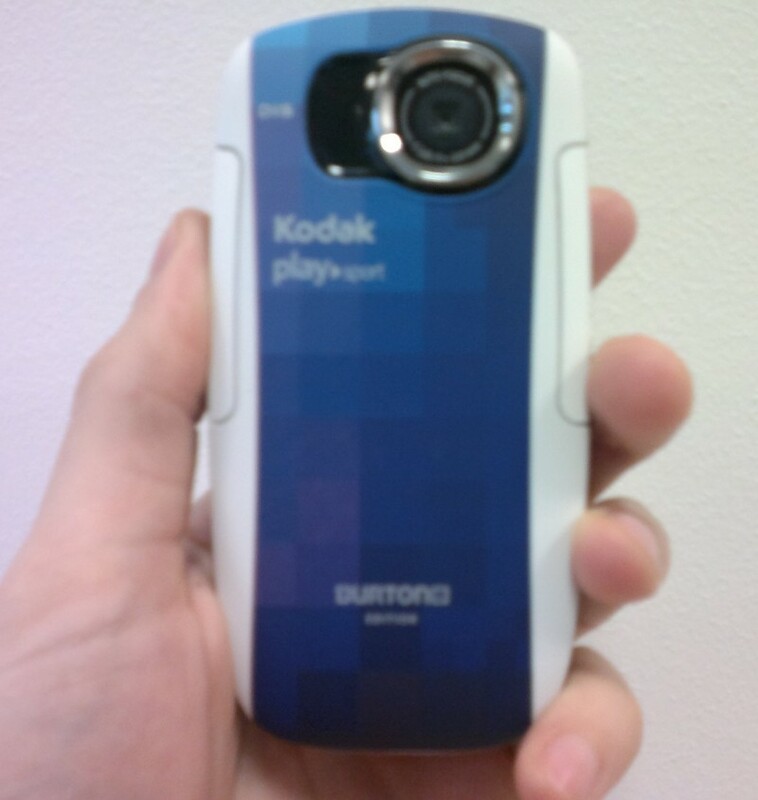 The Playsport is another Kodak device that has the new ‘Share’ function, which, if you don’t want to actually share your images and videos, can become a tad annoying. However, if you are keen on sharing, is rather good. Connecting the Zx5 to a PC will activate either the ‘Share’ function or the Kodak PULSE Display gallery. A Kodak version of Arcsoft’s Media Impression will also be installed once the Playsport is connected, meaning you can edit (to quite a decent standard as well) your footage and stills. A neat feature worth a quick mention is the ability to edit footage on the camera. Well, edit might be a stretching the truth, you can set the in and out point of clips as well as grabbing still shots from videos to turn them into photos. Something which could save you time and work later on. The previous Kodak Playsport, the Zx3 was and still is a popular device so, in theory, as the Zx5 is pretty much the same spec but with an improved shock rating and form factor, it should be well received. The Zx5 may not be jam-packed with fancy features but, for me, it does the things it says it does on the box and when it comes to the all-important video camera v Chuck Norris roundhouse kick, I can’t see many other handhelds faring any better. 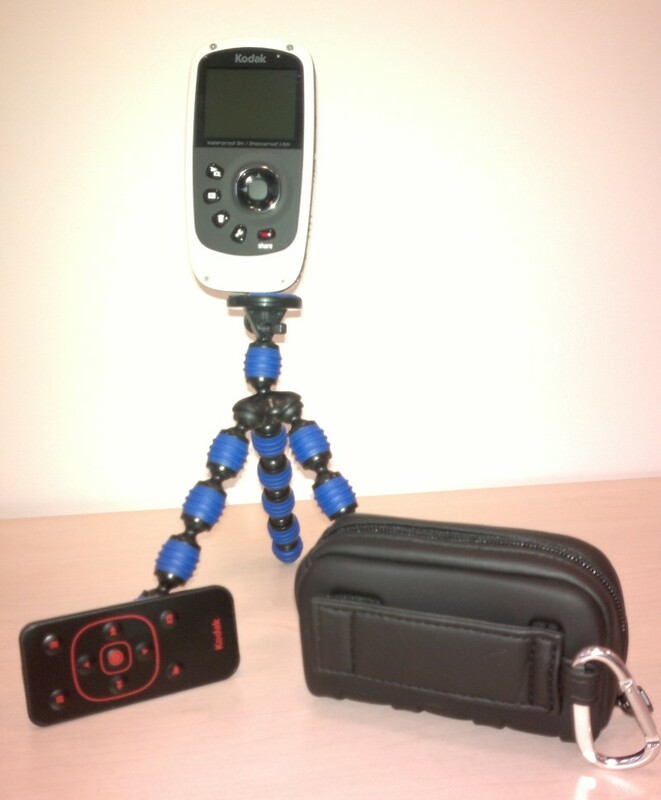 Although it is a little disappointing that this Playsport model does not have any built in memory, it is nonetheless a trendy, dependable and simple-to-use handheld video recorder that should survive and come in handy for any office outing, even those dreaded team building ones.